Good morning!!! Sorry, that I’ve been missing in action. I’ve been busy, but I’m here. I pray that everyone had a wonderful weekend. Today, I want to share a poem and I pray that it’s a blessing to you. God placed it on my heart and I wanted to share it. But today, Dear Lord, I give you my all! When will you choose to give God your all? When will you choose to surrender your way for God’s way? When will you decrease in order for Christ to increase in your life? I pray that you examine your life and ask God to empty you of your fleshly desires and to fill you up with His will and His way. God bless! © Nicole Ellis and Sunshine’s Reflections Blog, 2009 to 2014. Unauthorized use and/or duplication of this material without express and written permission from this blogs author and/or owner is strictly prohibited. Excerpts and links be used, provided that full and clear credit is given to Nicole L. Ellis and Sunshine’s Reflections Blog with appropriate and specific direction to the original content. “Fear not!” He said it, so believe it! Good afternoon! Happy Thursday to you all! TFTD: “Fear not!” He said it, so believe it! Let me take a moment to say, I love God. Everytime I read His word I get excited. How about you? Do you get excited when you read God’s word? It’s okay if you take a moment to answer. I know that sometimes the word is tight and may step all over your toes, but it’s a necessary word. That excites me. I appreciate that God not only gives me guidance and correction, but He also sends me a reassuring word. As you grow in your spiritual walk, I pray that you learn to take God at His word. We all have to face giants in this life. Giants include, but are not limited to; starting a new business, pursuing higher education, dealing with attacks from the enemy, nasty co-workers, dysfunctional family members, addictions, spiritual warfare and more. No matter what giant you have to face, the awesome news is that you don’t have anything to fear. God is with you. God is going to get you through the storm. When you spend more time with God, you will gain more confidence in His word. I dare you to take God at His word. Why is it that you can believe everything that your friends tell you or even family members and strangers, but you don’t believe everything God tells you? Umm hmm, you know I’m talking to you. It’s time to increase our faith and trust God. Since he said it, we need to believe it! Imagine what would happen to your life if you stopped allowing fear to cripple you and started trusting God’s word? Sky’s the limit! Fear not! Have a blessed day and stay encouraged! Good morning! Happy Monday to you all! I pray that you had a blessed weekend. Let’s be honest, Monday mornings are rough for many people. You may have had a busy weekend and wish you could sleep in on Monday morning. Or maybe you had such a relaxing weekend and you don’t want it to end. I think many of us have had times when we struggled to get out of bed. I know I have had many Monday mornings like that. There is something about Monday mornings, either it’s back to school or back to work. It’s always back to something on Monday. As I scroll down my Twitter feed or my Facebook timeline, I can’t help but notice how many people dread the infamous MONDAY morning. Today, I want to encourage you all to start changing your perspective. Your day typically is a reflection of your attitude. Believe it or not, you can effect your day by what you speak into the atmosphere. I know you may not be a Monday person, but look at it this way, it’s a new day. If you go back to work on Mondays, than be grateful that you have a job to go back to. If you go back to school on Mondays, than be thankful that you are in school. 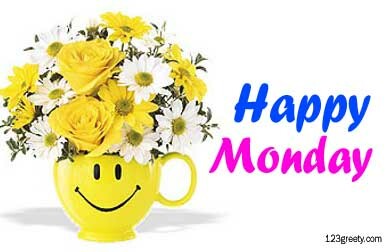 Instead of having the Monday blues spread Monday morning-glory to everyone. The above scripture says give thanks to ALL things. I declare that you should be thankful for this Monday morning. God didn’t have to wake you up this morning, but He did. That’s more than enough to start my day off right. What if God responded to Mondays the way you do? What if His attitude was gloomy Monday instead of graceful Monday? What if God didn’t pass out blessings based on how you respond to Monday mornings? This is a self check for me. Our thoughts become our words and our words become our actions. Give thanks and spread Monday morning-glory! It’s a new work week. Be thankful!!! I pray that you have a wonderful Monday and an awesome rest of the week! God is in the blessing business. Good morning! Happy Friday. This is the day that the Lord has made, CHOOSE to rejoice and be glad in it. There is so much to be grateful for and I choose to rejoice in the Lord today and forevermore. Everyone doesn’t want to see you happy and everyone will not support you and your goals! I know you are sweet as pie, accomplished, active in your community, church, and family, you may even lead organizations, you are diligent in your studies, and have a good work ethic, but EVERYONE doesn’t care about that. Some people can’t stand the fact that you are doing well and please don’t have children who are doing well also because they can’t stand that either. Some people will smile in your face and talk behind your back. They can’t stand seeing you do well. You may have a few people around you right now, that turn their noses up at you whenever you have something to say. HOW DARE YOU BE SO BLESSED! We’ll I have great news for you: Those people who don’t care about you or who hate on you don’t matter. What matters is that God has called you to do great things and that blessing will flow over to your children. And those who love you will begin reaping the overflow from your blessing. 8 Finally, all of you be of one mind, having compassion for one another; love as brothers, b e tender-hearted, be courteous;[a] 9 not returning evil for evil or reviling for reviling, but on the contrary blessing, knowing that you were called to this, that you may inherit a blessing. When people are mean and nasty to you, be nice to them. Bless people with kindness. When people hate on you, love on them. When people talk about you, pray for them. What God has for you, is for you and nothing they say or do can take that away from you. 17 Every good gift and every perfect gift is from above, and comes down from the Father of lights, with whom there is no variation or shadow of turning. Every good and perfect gift comes from the LORD, so man can’t give or take away the things that God has for you. You are called for a purpose and God will make sure that all things work out for good. At the end of the day, God gets the glory. So don’t worry about what people say. Everyone can not and will not understand the calling on your life because they didn’t get the call, God gave it to you! Have a blessed day knowing that God is working things out in your life for a divine purpose. Surround yourself with those people who will sharpen you and pray for those who try to dull your spirits. Keep doing what God has called you to do!!! Have a wonderful weekend! Good morning! Happy Wednesday to you all! I am back and ready to post. I had a wonderful relaxing time with my family. I praise God for family time. Here is a word of advice, always make sure you make time to enjoy life. Don’t let life run you ragged. 23 Keep your heart with all diligence, For out of it spring the issues of life. 30 A sound heart is life to the body, But envy is rottenness to the bones. I have been trying to get this blog out since Friday, but God’s timing is better than mine. As I read God’s word I see that life begins with the heart. The heart pumps blood throughout our blood vessels which leads blood through our entire body. The heart is a vital organ and we need it to sustain life. Physically, there is no question that the heart is essential. The heart is not only vital physically, but the condition of the heart is important spiritually. Take a moment to ask yourself, “What is the condition of my heart? What do I hide in my heart? Is it love, bitterness, anger, hate, kindness, joy, malice or peace? 10 With my whole heart I have sought You; Oh, let me not wander from Your commandments! 11 Your word I have hidden in my heart, That I might not sin against You. As long as we live on this earth we will sin and fall short of God’s glory, but we can combat sin by hiding God’s word in our hearts. We can combat sin by seeking God with our whole heart. There are a lot of people who need a spiritual heart transplant. Maybe you have been hurt so long that all you know is hate. Maybe you have misused or abused and you keep revenge in your heart. There are a lot of believers who are walking around with damaged hearts and try to keep hate and bitterness in one half and love on the other half. This can’t work. You need a spiritual heart transplant. You need to surrender your heart to God. I challenge you all to take a moment to seek God in your quiet time. Really sit down and tell God what’s in your heart. You may be surprised to find out that you too need a spiritual heart transplant. I want to tell you that’s okay. There is power in acknowledging that you need help. The danger comes when you walk around in denial like you are perfect. Surrender and ask God to change your heart. I come boldly to God asking Him to search my heart and examine it and anything that is not pleasing to Him reveal it to me. Lord, expose my indiscretions so that I can get right with you. YOUR WORD I HIDE IN MY HEART, THAT I MIGHT NOT SIN AGAINST YOU! I pray that you all take inventory over the condition of your heart. Have a blessed day and know that a spiritual heart transplant is free. God wants to change your heart!